This year the chilli festival was pushed back a few weeks to the second weekend in March – previous years have seen it held in mid-February. I don’t know if it was planned that way to escape the inevitable searing heat but even if that wasn’t an intentional side-effect, I’m grateful. Last year it was far too hot for comfort. 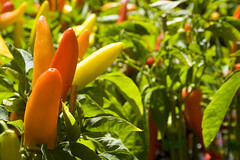 This year it was warm but the extreme heat was reserved for the chillis. I wanted to buy a bottle of my fave from last year, but DeathSauce was not at the Festival. We did get a few jars of various hot condiments, including a jar of chilis in lime and tequila, the red stuff pictured above, which was actually really sweet. I saw the sauce that nearly killed me and Ben last year, and stayed well away. Overall there were not as many stalls as last year, which was a little disappointing, but on the up side parking was much easier (or maybe that was because we went Saturday and not Sunday). ~ by goat_admin on March 12, 2007. I was too lazy to get to the chilli festival this year. I am trying to make it an annual pilgrimage. It’s also my aim to learn to look ahead and not just consider the immediate delight of chillis -there is always …. the next day! (Too much info for a first comment?) 😉 Now I am looking forward to the food and wine festival. Bring it on! !